When someone is involved in a collision with a large commercial truck or big rig, they may make the mistake of thinking that the accident will be sorted out just like a routine fender-bender with a sedan. There are some major differences you need to be aware of if you are hit by a tractor-trailer or 18-wheeler. First and foremost, the damage to your vehicle will likely be much more severe if it is hit by a commercial truck. That is because most commercial trucks weigh in excess of 10,000 pounds. The incredible size and weight of these vehicles is a big reason why commercial truck operators require extensive training on how to handle a commercial truck and must have a valid CDL (commercial driver’s license) to legally operate this vehicle on public roads and highways. It takes much longer for a truck to come to a complete stop due to the weight of the vehicle. Furthermore, commercial trucks are generally multi-axle vehicles comprised of a tractor and a trailer. This means there are maneuverability and operation issues not present in other smaller vehicles like sedans, SUVs or pickup trucks. In addition, certain types of large tanker trucks may be hauling flammable chemicals or other dangerous substances. Getting involved in a collision with one of these vehicles can prove to be deadly and cause extensive damage to the surrounding area. As mentioned earlier, commercial truck operators must undergo rigorous training before they can legally get behind the wheel of one of these behemoth trucks. The specialized training they receive generally means they are held to a higher standard if a serious accident were to occur. This is why it is so concerning to learn about people being able to obtain CDLs after just one day of course training and a few hours behind the wheel of a truck. Setting the bar that low is an invitation for deadly truck accidents to occur. Approximately 3,852 people were killed in accidents involving large commercial trucks in 2015. That translates to a shocking 22 percent increase when compared to truck accident data from 2009, according to the Insurance Information Institute. Another important distinction between a collision between two sedans and a collision between a sedan and a commercial truck is the extent of the bodily Injuries suffered by the occupants of the smaller vehicle. When two sedans collide, there is a good chance to can escape the collision unscathed or with soft tissue injuries that can be treated and healed. When a sedan is hit by a commercial truck, there is a good chance you may suffer a catastrophic injury such as fractured bones, spinal cord damage, a traumatic brain injury, internal bleeding, and so forth. 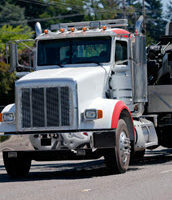 Another key difference is the ability to bring in the truck operator’s employer into a personal injury lawsuit. Employers, including trucking companies, can be held liable for the harms and losses caused by their employees if the employee acted negligently during the scope of their employment. If you or a loved one was seriously injured in an accident caused by the operator of a commercial truck, you need an attorney with experience dealing with the complexities of truck accident litigation. Gillette Law, P.A. is here to help. Contact our office today for a free case review.